She believes that you look as good as you eat and swears by millets and oils. Ishika Sachdev, daughter of restaurateur Vipin Sachdev and director of Tuscana, moonlights as an advocate of healthy eating and living, through YouTube videos and her blog, thebeautyreel.com. Having a fascination for beauty/fashion magazines for as long as she can remember (she even has copies of Vogue dating back to the 1980s), Ishika was inevitably smitten when the concept of blogging started spreading years ago. And a year after completing her hotel management in Switzerland, shea��s finally found the time to start her own. Staying completely away from what she calls the a�?three whitesa�? (white rice, sugar and flour), Ishika, whose gluten-free chia seed cookie video is doing the rounds on Facebook, eats only gluten-free food and stocks up on products from Terra Earthfood. a�?I admire its founder Meera Maran,a�? she says, admitting that she reads up on all their product labels to discover interesting healthy substitutes for everyday foods. a�?They fry their murukkus in coconut oil. And I always use coconut oil as a substitute for butter or margarine,a�? she says, explaining that cold-pressed virgin coconut oil is both tasteless and odourless, and can be used in cooking and baking. a�?I even read this article about how model Miranda Kerra��s dietician made her drink two tablespoons of the oil every day to stay healthy,a�? 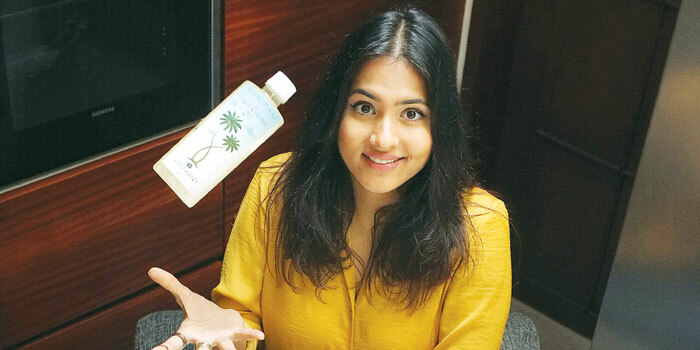 shares Ishika, 24, whose first video was on oil pulling. Coming up next on her blog, are posts on making chilli oil, almond milk and a range of healthy saladas. A mix of red chilli and oil is great for reducing hair fall, she says, adding that subsequent posts will also be on sweet products like brownies, featuring honey or dates instead of sugar. Ishika also shares a few substitutes for favourite foods at home. a�?I make rotis with a mix of amaranth millet, pearl millet or jowar, drumstick leaf powder and flax seed powder,a�? she shares, pointing out that in addition to being gluten-free, this ensures your rotis are loaded with protein. And a fan of dosas, she recommends the pesarattu version, made with foxtail millet used instead of rice flour. Interestingly, this youngster stays away from fruits, save for an occasional banana or pomegranate. a�?I just avoid the excess fructose because my salads give me all the necessary nutrients. But if you dona��t eat raw vegetables, then fruits are great for you,a�? she reasons.